The stage is set for the 2019 Calypso Quarters Finals on Saturday, February 2, 2019 at the Windsor Park Sports Stadium forecourt said Public Relations Officer (PRO) of the Dominica Calypso Association (DCA) Derrick "Hunter" St. Rose. "We are ready to go…we also have good parking for our patrons so we urge people to be on time because as usual the show will start bang time 8:30 pm," St. Rose said. He said that the move this year from the Newtown Savannah to the stadium forecourt is because they are contemplating staging the Finals at the stadium and they wanted to "get a feel of the environment." "The show is $30 standing and for seating is $40 and the band Swinging Stars is set to go with security SSU tight," he said. 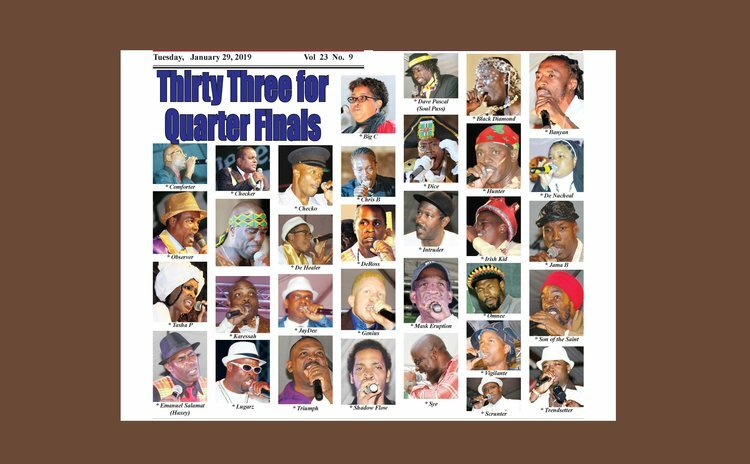 The 34 calypsonian to compete in the Quarter Finals are: Haxey, Sye, Hunter, Deros, Vigilante, Karrasah, Dice, Irish Kid, Nasheal, Chris B, Tasha P, Scrunter, De Healer, Big C, Webb, Jayde, Danyan, Mask Eruption, Black Diamond, Triumph, Soul Puss, Son of the Saint, Omnee, Lugarz, Comforter, Jama B, Intruder, Checko, Checker, Shadow Flow, Observer, Genius, Tronada and Trendsetter. Twenty will move on to the Semi Finals scheduled to be held on 16 February 2019.